I already know I want it! Sign me up now. Five year olds are cute. Speaking French like you’re five isn’t. Are you embarrassed to admit that you’ve been studying French for so long and you don’t have much to show for it? You’ve got a lot on your plate and little time, let alone energy, left to study French, once you’re done with your day. You don’t have a lot of opportunities to speak French, and when you do, you feel shy or embarrassed. You have to “Frenglish your way” out of situations, or to make a friend speak French for you. You have a collection of French learning material that’s gathering dust, because they’re no fun and/or they don’t teach anything relevant to your life. You’ve tried courses or tutoring before but ugh! Let’s just say it didn’t have much of a positive impact on your French skills - or your confidence. It hurts to admit it, but this whole French learning story makes you, a smart and successful person, kinda feel like a failure. You are frustrated and disappointed at your lack of progress. You will feel so proud and accomplished once you are finally able to speak French with ease. Picture this: you are at a dinner party in Paris with your new French friends, and, over their delicious French food, they are speaking about politics, culture and the state of the world. You participate fully in the conversation, with light and witty comments. Everybody listens to what you say, because you can express your great ideas in perfect French with complete ease. They even laugh at your jokes! You take a sip of your French wine and realize that you have accomplished what is only a dream for many people like you: being able to speak a foreign language fluently. Now, when when a cop pulls you over, and asks for license and registration, it’s the most routine thing ever for you. You walk in and out of French shops and can run any errand like it was never a big deal. Does this sound like a distant fantasy? Are you right now fighting to piece a sentence together, and by the time you have it, the conversation has moved on? Are you scared, not just of cops but of any French speaker? Do you have the nagging feeling that your “French learning” books and apps just aren’t able to get you much closer to this goal? Well, sadly, you’re right. That’s why I created Your Roadmap to Fluency. A proven + tailored French learning system that helps you learn what really matters to you and make progress fast. After working 10+ years in the language learning industry, I realized that there is a deep disconnect between how people try to learn French (i.e. with any “tool” that’s sold to them through efficient marketing) and what they should really be doing to learn French for real, in real life. Nobody has ever learned French thanks to an app. Best case scenario, an app can help you, if you know how to use it, as part of a well-thought plan. There is a world of difference between how polyglots use apps and tools to help them learn more languages and how a person learning French as their first language tries to use them, left to their own devices. Your Roadmap to Fluency is the missing link between you and the dream French skills that you deserve. Its purpose is to bring you the insider methods that polyglots (like myself) use to learn languages, in a concise and actionable learning plan, created just for you. He will tell you how he could learn French within five months with his roadmap to Fluency. When you click the red buttons on this page, you will be taken to a check out page. After you check out, you will receive a gift code. You can use this code yourself, or gift it to a loved one. It is valid for one year. The gift code can be redeemed right away by booking an appointment directly in my calendar. You’ll get the link to my calendar alongside your code. Choose a time slot for our call that’s convenient for you. Once our call is scheduled, you’ll receive a link to a questionnaire. Please fill it out thoroughly, at least 24 hours before our call. This helps me prepare our conversation so we can make the most of our time together. It’s the big day! We have an hour together. I will ask you a few questions and listen attentively to all you will say about your current situation, your French study and your goals. The call is recorded so I can listen again when I prepare Your Roadmap to Fluency, if needed. This recording will never be shared with anyone else. During our conversation, I will start making suggestions about how you could make your study more efficient. You can also ask me any question you have. 4) Your Roadmap to Fluency is here! Within 24 hours, you receive Your Personal Roadmap to Fluency, and all its bonuses You’re gonna love it! Being able to implement and stick to your learning plan is the key to your success. To help you with this, I will email you the steps you need to take everyday for a week and then every week for a month. This way, you’ll always know what to do and when - and of course I’m only one reply away if you have any question. You can book it at any time by redeeming your code. In this session you can ask me any question you have, and practice French with me. It’s also a great way to get a taste of how working with me on a 6-months package feels. She learned to speak fluent French while working and studying full time in the US - and the Roadmap helped her save time and money! Just how much work do you have to put in daily or weekly, to make visible progress? You’ll be surprised: it’s much less than you think. On this page, I tell you exactly what you need to do, how often, and how it can fit smoothly in your existing schedule. We will exploit your commute, your Netflix time (don’t worry, you’ll still keep watching Netflix during that time) and many other things that you already do. This section is the real deal. Did you know that the majority of what you could study is completely irrelevant? Even natives only ever use a tiny fraction of their language (of course this fraction is different for everyone, depending on their age, profession, gender, social class, etc.). Because of this, you could literally be stuffing your head with useless words and structures for your whole life without seeing any visible progress. Now, that explains things, doesn’t it? The good news is, in Your Roadmap to Fluency, you will get a list of all you need to study on just one page. And you can say au revoir to all the rest. Ok, sometimes I put a grammar book in there. But I swear it’s the best grammar book in the world ever and I only give it to people who feel the need to learn grammar. Ergo, if you hate grammar, you won’t get it. It’s all personalized, remember? Do you have an exotic hobby or profession that’s not in this list? Go ahead and book your session. You know I love a challenge. I have yet to find a topic I couldn’t find a French YouTube channel or podcast about. Because consistency is key, this study tracker will help you make sure that you complete your French learning tasks every day. You’ll be amazed at what results you get when you study for 5-10 minutes each an every day. 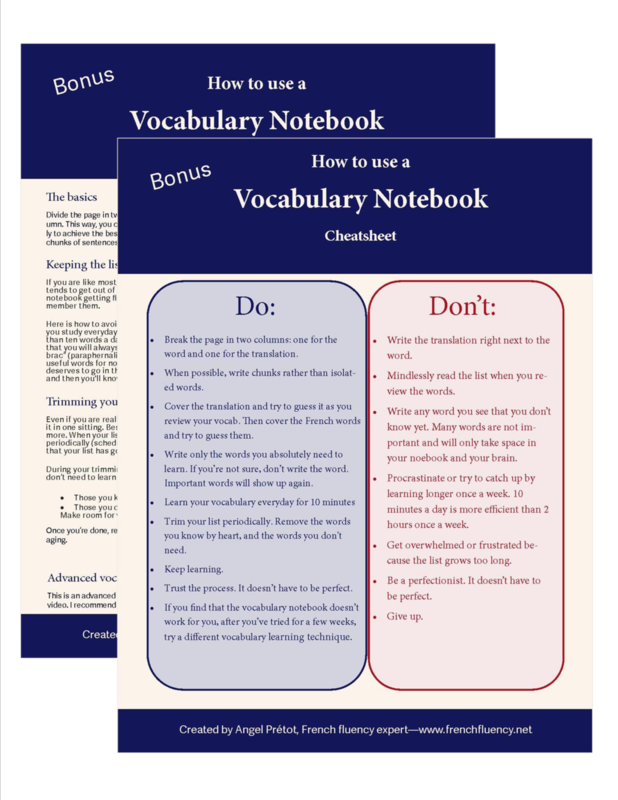 Your vocabulary notebook is your brain’s best friend. It’s the place where your new French words live when you haven’t assimilated them yet. This guide will help you make the most of this amazing tool. Use the cheatsheet for fast reference. When you learn a French word, how can you be sure that you learn all there is to know about it? You know, with the article, feminine and plural forms, conjugation types for verbs, etc. You use this guide, that’s how. This visual guide shows you everything you need to learn about a word (whether it’s a noun, verb, adjective etc.) and what details you need to write down to learn vocabulary the right way. To use on sticky notes, in your notebook, in your flashcard app or wherever you store new vocabulary. How can you make sure that what you practice with your partner is actually relevant to your real life? This guide will help you navigate these challenges like a champ. For the most part, it also applies to working with a tutor on platforms like italki, if you prefer this to a language exchange. Use the cheatsheet for a quickstart or future reference. Created with busy adults like you in mind, this e-course helps you analyze your schedule and reclaim your time. You will learn how to identify and take advantage of 3 different types of moments. This is the exact same system that I use during our Roadmap to Fluency call to create your personal study plan. Thanks to this e-course, you will be able to upgrade and adapt your study plan by yourself whenever you feel the need to change it up. This ebook will teach you my personal goal setting process. With your Roadmap to Fluency, you can learn French entirely on your own. But you don’t have to. Some students rock it with just the Roadmap. Others benefit from weekly or monthly guidance from me. 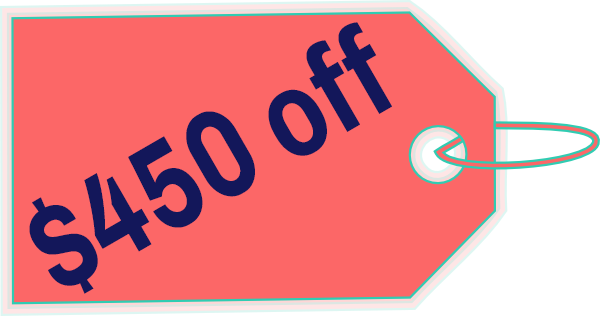 If that’s your case, you’ll now have a $450 voucher that you can redeem when you purchase you follow-up package. This voucher will be valid until the end of 2019. Plenty of time to decide! A 60-minute session with me would normally cost at least $150, and they now only come in packages.With your Roadmap, you get one session included. During that session, we can work out the last details that you need sorted to really learn French successfully, on your own with the Roadmap. Or we can kick off your regular study, before you commit to a follow-up package (and then you can apply your $450 voucher towards that package). She will tell you how her Roadmap to Fluency impacted her life and her French study. Got it! Sign me up now. So, how much is it, in total? So, who’s this French polyglot guy? Hi :) I’m Angel Prétot, French Learning Coach. My super power is turning people who speak only English into people who speak English and French. I can’t wait to use this super power on you! Born and raised in France, I have learned five languages to fluency and I have a master’s degree in French language didactics. I have been teaching and coaching French students around the world for the past 15 years. Your Roadmap to Fluency is different from everything you’ve tried before. Brilliant packaging convinces you that it’s the best thing since sliced bread, so you buy it. You open it, try it for a while, find out that it’s hard to use/ overwhelming/ not applicable/ why am I learning this?/ boring and not fun. So you put it on a shelf where it will gather dust. If you’re very organized, you put it on the shelf that already collects all your French learning stuff. Later, you buy something else, hoping that it finally clicks. And the cycle starts again. Contrary to the tools in your existing collection, Your Roadmap to Fluency is designed for you to use it everyday from the moment you receive it until you are finally fluent (and possibly afterwards too). It is meant to be your companion for your entire journey and to be updated if it starts losing relevance. Your Roadmap to Fluency would be very sad if you’d leave it to gather dust, because it has the potential to help you become fluent faster than you can imagine. I have no idea! When this offer expires, I will work with my new and existing students. My existing students always have priority over potential new ones. It is very important for me to take time to create a high quality, completely personalized learning plan for each of my students, and to give them all the support they need. For this reason, I will only offer new spots when I'm certain that all my students have all the guidance they want AND I have significant free space in my calendar. This will take months. And in those months, you could become fluent already. So please don't wait. You'd rather be one of the students who has absolute priority access, than one who's outside, looking in. Squeeze yourself in while you can! If you don’t absolutely love Your Roadmap to Fluency when you receive it, I’ll hop on skype with you again and troubleshoot it to make it absolutely perfect. Have you ever wondered how polyglots manage to fit many languages in their life along with an often very demanding job, a family, a social life and other hobbies besides languages? Well they’ve mastered the techniques in Your Roadmap to Fluency. I know this first hand, because I’m one of them. If you want to go from “5 year-old French” to smooth dinner conversations, you’re going to love Your Roadmap to Fluency! You travel to French speaking countries and you want to get the real thing, not a watered-down-for-tourists experience. You live in a French speaking country and you need to speak the language that surrounds you. Your partner or spouse is a French speaker and you want to connect with their family and culture. You are raising bilingual children and you don’t want to be the only one left out of French conversations. You need to speak French in your current or future job. - Your friend, three months after you start using Your Roadmap to Fluency. Start making visible progress immediately. Feel that what you learn is applicable in your life. Gain confidence and become able to interact with natives without being shy or embarrassed. Get used to the regular speed of natives and be able to understand them. Start thinking in French and become able to participate in conversations without searching for your words. Enjoy your study and love the resources you use. Be super proud of your new French skills. I want that. Schedule my appointement now. Yes, I am, that’s actually the very reason why I got shipped to the middle of the Alps, where I had the most incredible language learning adventure of my life (so far). When I was 25, I got my first job abroad, as a French teaching assistant. In Europe, we like to ship young natives to high schools of other countries, so that students can get in touch with actual speakers of the language they learn. We call them language assistants. I had always wanted to learn German (you should see the collection of dust gathering German resources I had back then!) so I thought it would be a good idea to be a French assistant in Austria. I was assigned a position in this adorable town named Gmunden, and my life promptly turned into a linguistic nightmare. I knew some German (not much) but 99% of what I heard was local gibberish. They speak a dialect there. I didn’t know. I had to learn to understand the local gibberish AND also learn to speak German (which the locals understood but rarely spoke) to survive there year as an expat for a whole school year. All this to say, I’ve been in your shoes. It took me a lot of efforts to get through whichever situation I would have to face daily, as an expat in a tiny town. You know like find a flat, get any weird paper I happen to need, acquire edible food so I don’t starve, etc. I had to learn fast and it wasn’t easy. Because, you see, nobody told me how to do that. And even with my great track record of learning and teaching languages, I still had a steep learning curve. As you can see, I survived. Later, I even passed by German B2 certificate. And the best news? You don’t have to suffer like I did. Your Roadmap to Fluency’s sole purpose is to make your French learning journey smooth and enjoyable - with a compassionate French learning coach who understands what you’re going through. As opposed to, you know, a bunch of villagers who make it clear that you must be really dumb not to naturally understand their gibberish. Who should NOT get their Roadmap to Fluency? Do not get Your Roadmap to Fluency if you are merely curious about French and not committed to learning it. Learning a language is a commitment. Your Roadmap to Fluency will make it easier for you. It will remove all the barriers that you will face in Your French Learning journey, but you still have to do the work. I can make the perfect plan for you, I can show you how and when you have time to learn French and what you should be doing. I can even put you back on track if you fall off. But if you aren’t committed, there’s nothing I can do for you. There are only so many spots available and these should go to students who will do the work and benefit from my expertise. Better French learning methods, for you and for everyone else. 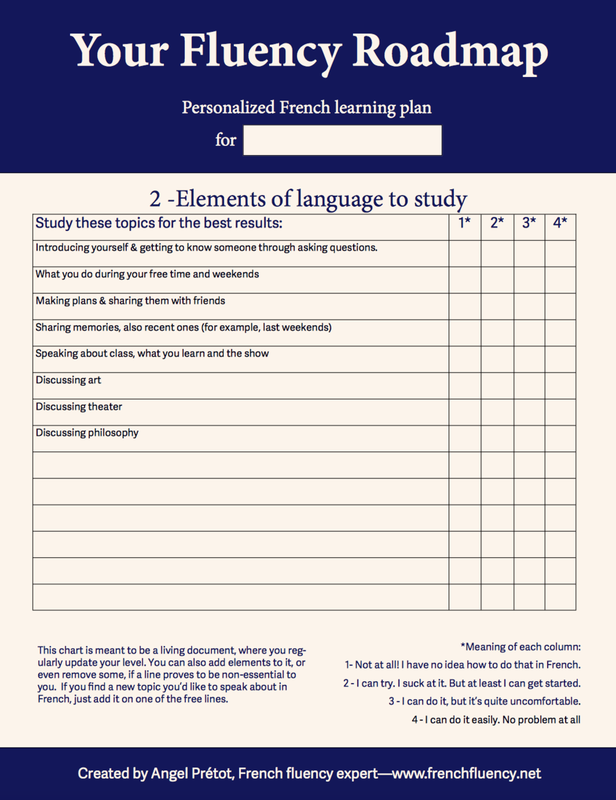 When you invest in Your Roadmap to Fluency, you’re not only getting an amazing, highly personalized French learning plan for yourself. You’re also providing me with the resources and informations I need to keep innovating, developing better products and services, and especially better free content that can be used by anyone, no matter if they can afford to spend money on it or not. I truly believe that learning a second language makes us all more tolerant and more human. I am so proud that I can give people from more than 175 countries access to better French learning methods via my website FrenchFluency.net. When you choose to work with me personally as a student, you’re not only investing in your French skills. As a side effect, you are also helping everyone else improve theirs. Friendly reminder: this offer expires soon - and when it's expired, I don't know when I'll be able to accept new students. My existing students always have priority and I'll only be able to offer new spots when all my students have the guidance they need AND I have significant free space in my calendar. You'd rather be one of the students who has priority than one who's on the outside waiting to get in - just saying. So squeeze yourself in while you can. It's very simple: you need a VoIP software, like Skype (free for Windows, Mac and Linus) or FaceTime (Free - mac users only). The Roadmap will be delivered to you per email. All the files I will send you can be opened in your browser (= the software you use to access the internet). Can't get any simpler! Mondat to Saturday, between 1PM and 8PM CET (Paris), which corresponds to GMT (London) 12PM-7PM / ET (US East Coast) 7AM-2PM / PT (US West Coast) 4AM-11AM. Please make sure some of these time slots work for you before booking your spot. Your Roadmap to Fluency is tailored to fit in your existing schedule. If you are very busy, your study can take as little as 5-10 minutes per day + 1 hour once a week. Yes! I have some great news for you. To learn French, you don’t need to be focused. One of my favourite strategies, which I use often to practice languages, is to zone out in front of a Netflix serie in the language as a way to relax. It’s entertaining and amazingly efficient. It’s a great way to use the time when your brain has already given up on doing stuff for the day. And if you think of it, it makes total sense: nobodyhas ever seen a baby trying hard to learn a language. And yet they all learn. Yes! Your Roadmap to Fluency contains super simple and quick daily and weekly activities, as well as a tracker (Bonus #1) to make sure you get them done. Studying consistently has never been this easy. Yes. Your Bonus#1 “Study tracker” is meant to track your learning activities. Also, in part 2 of Your Roadmap to Fluency, “Content”, there is an easy-to-use chart that lets you reevaluate your level as you go. You can use it to track the actual progress of your French skills. Yes! Your Roadmap to Fluency is designed to fit nicely in your current life, but of course if your circumstances change, it might become less adapted. Whenever this happens, you can (and should) come back to me for a follow up session. Together, we will take into account what has changed and find out which tweaks we need to make, so Your Roadmap to Fluency becomes efficient again. Investing in Your Roadmap to Fluency is the guarantee that you will always have a compassionate coach to turn to when things don’t go as planned. Absolutely! Your Roadmap to Fluency is designed for you to learn real life French, and that also means real life speed. In part 3 of Your Roadmap to Fluency, “Recommended resources”, you will find a list of real French resources. I hand pick those for you to make sure that you love what they speak about. And your mission is to get used to their speed, one “French bath for your brain” at a time. Don’t worry, I’ll give you all the explanations. Yes! Your Roadmap to Fluency comes with the strategies you need to create these opportunities. Also, the bonus#4 “Ultimate guide to language exchange” is a great resource to find ways to have as many conversations as you want. 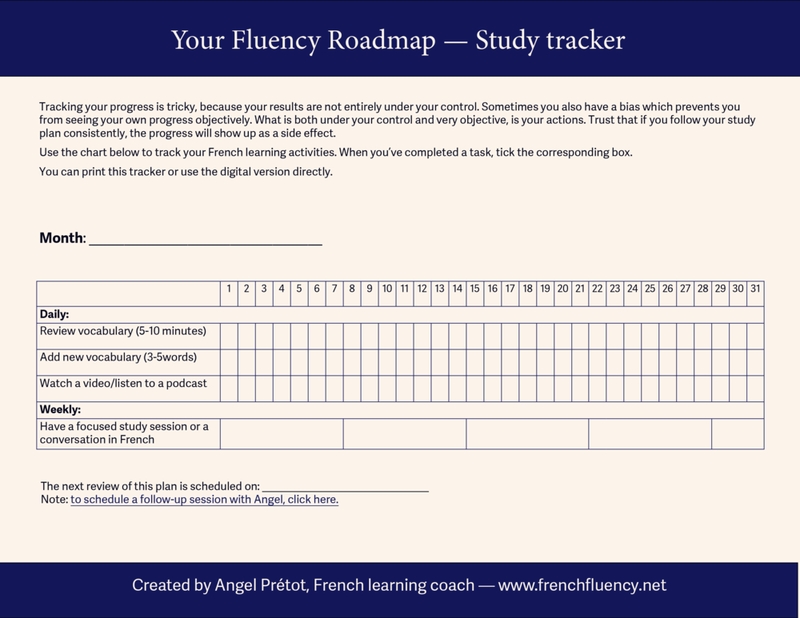 Your Roadmap to Fluency is custom-made to be your companion during your French learning journey. It brings you the very techniques and tools that polyglots use to learn several languages and keep them alive, in an easily actionable plan. Your Roadmap to Fluency is nothing like what you’ve tried before. It is the real deal. Just check out the many testimonials on this page. Welcome, fellow introvert! Did you know that some experts say that being an introvert is actually an advantage when it comes to learning a language? Our love for books and sitting in solitude leads us to mastering a language very thoroughly and accurately. While it’s true that the speaking part isn’t as easy for us as for our extroverted peers, when we get over it, we tend to speak way better and more fluently than they do. Many of my polyglot friends are introverts just like myself and we can all confirm that learning French “the introvert way” is a winning strategy. Also, I can assure you that your Roadmap to Fluency will contain a lot of activities that you can do alone, and comparatively few “social” activities. Trust is at the heart of the coaching relationship. You should never hire a coach that you don’t trust. As you can see in the testimonials, my students vouch for me, but if you don’t trust me just yet, please take your time to think, and to enjoy more of my free content and email advice. If you have any doubt or question, please email me and we’ll take it from there. If you don’t have time to learn French, it means one of two things: Either learning French isn’t that important for you. In which case that’s cool, you can leave this page and go back to pursuing your actual priorities. Or you just don’t know how to manage your time, which is something I take very seriously and address systematically during our Roadmap to Fluency call. So, book this call right now. Yes. Even though this service wasn’t specifically designed for people who have never studied French, I have created Roadmaps to Fluency for complete beginners before and it works. Yes! Your Roadmap to Fluency will focus on what you need to do to become fluent for good, to enrich your vocabulary, be able to speak with more nuances and know the French culture better. And you’ll have a blast doing it. I love working with advanced students! So, by all means, get yourself booked into my calendar. Yes. 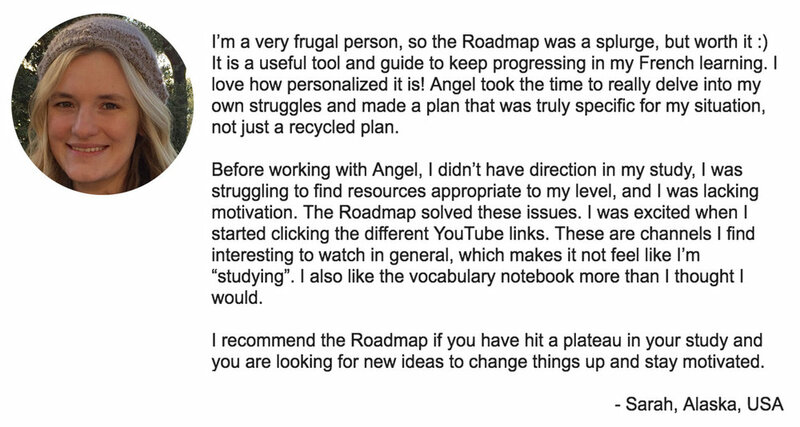 After you’ve received your Roadmap to Fluency, you have two ways to study with me one on one on a regular basis: take frequent follow up sessions (1 hour as often as you want) or enroll in my programm Fast Road to Fluency (2x40 minutes per week for two months). We can also discuss this together during a call if you’re not sure. Absolutely! Your Roadmap to Fluency takes into account your environment. A French speaking spouse (and/or child!) is a great advantage! Your Roadmap to Fluency will include activities to do with your spouse, and even challenges for you and your spouse to complete together. Learning with a study buddy is one of the best ways to learn French. Congratulations on being on this journey together! Your Roadmap to Fluency is a personal learning plan. This means that it is designed for just one person, but I can make one for each of you, with different recommendations depending on your particularities, and it will feature tasks and challenges for both of you to do together. Plus, I have a referral program, and you’ll get a free follow up session if you refer your friend. No. But I recommend you start with a language and study it seriously before you move on to the next one, in order to avoid confusion. Once you have a good level in a language, it becomes much easier to learn other languages (that’s how I became a polyglot!). If you choose to start with French, Your Roadmap to Fluency will teach you efficient language learning strategies that you can later apply to learn other languages faster. No. This is a service and I will be putting my best work into creating the perfect plan for you. Besides, spots in my calendar are extremely limited and by booking a spot, you are showing your commitment to your French learning journey. Frenchfluency.net is the property of Language Academy Frangel UG (Haftungsbeschrankt), registered in Berlin, Germany. Should a dispute arise, it must be heard by a court of competent jurisdiction in Germany. Do you have another question? Please email me and I'll get back to you ASAP.